We Have Access to Collective Access!! 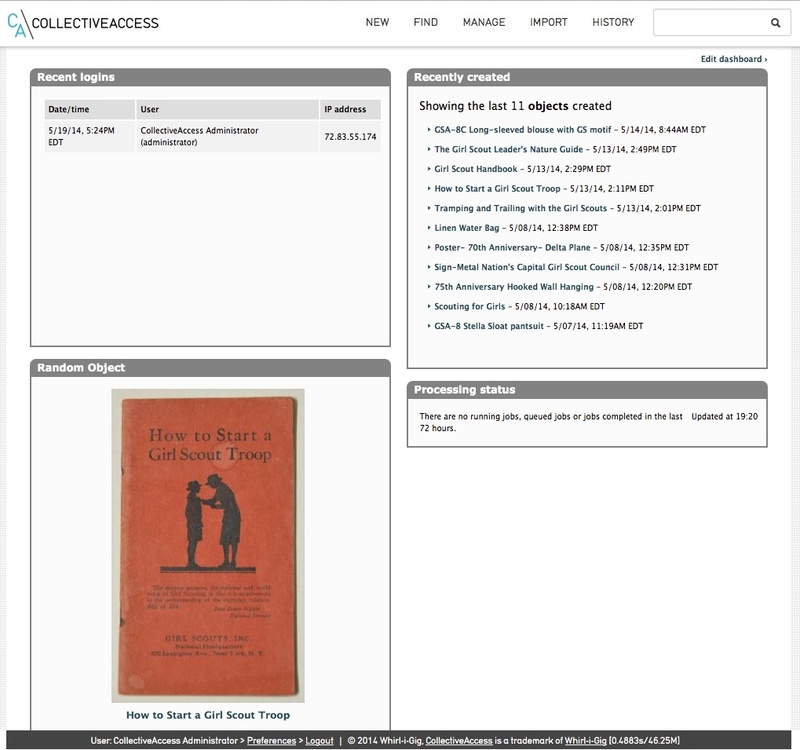 Our new archival inventory program, Collective Access, is finally up and running!! We actually have had a working version in place for nearly a year, but some bug in the setup blocked all images. We could inventory items, but not attach images or related PDF files. Where’s the fun in that? Eventually, our Council’s IT consultant, after checking with the software developer, went back to square one and created a new server with a fresh version of the program. Whatever the original problem, we are in business now. 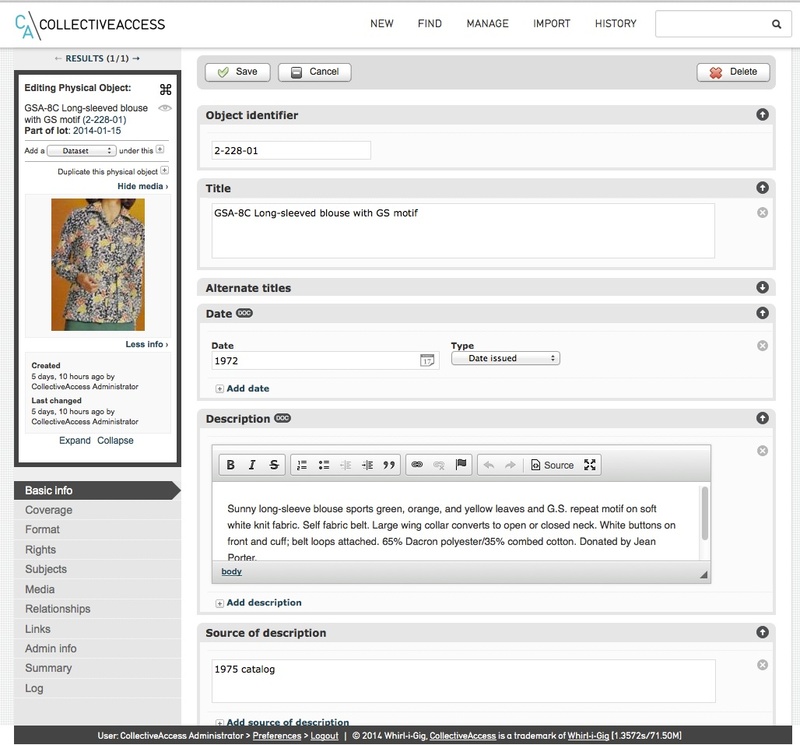 As explained in previous posts, Collective Access is an open source collections management program for museums and archives. Let me give you a peak behind the curtain and show you how it works. After logging in, I get my dashboard. Each user can customize their own landing page with a selection of widgets. My dashboard tells me who logged in recently, lists the latest items added, and displays a random object from our collection. Because Collective Access is web-based, multiple users can simultaneously enter data from remote locations. Next I can add a new item, entity, or event using the NEW menu or work on an existing record using FIND. 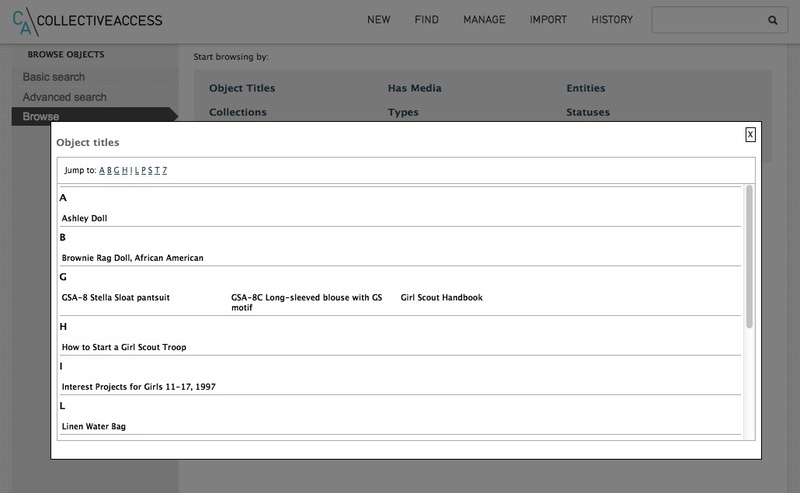 I select Browse by Object Titles and get a list of items in the collection. Data entry screens include fields for inventory numbers, object titles, and descriptions. Multiple dates can be used, such as date created, accepted, and copyrighted. Images are entered separately and then associated with the object through the Media and Relationship screens in the lower left. For National Equipment Service items, we are using the GSUSA catalog number + hyphen + sequential number. That could one day make it easier to share our system with other councils, as it gives a common reference point. For uniforms, the object title begins with the National Historic Preservation Center’s classification system. Collective Access uses “type-ahead fields” that automatically offer suggestions after typing a few letters in a field, which is a big help. The object description came from the 1975 catalog. We’ve used the date field to indicate when the garment first became available. The blouse photo is a screenshot from an old catalog. Of course we will attach actual photos of garment 2-228-01, but I don’t have them handy at the moment. This is just a brief introduction to Collective Access at Nation’s Capital. We are just learning the software ourselves, and I will post more examples in the weeks to come. Questions? Comments? Red flags? Let me know! 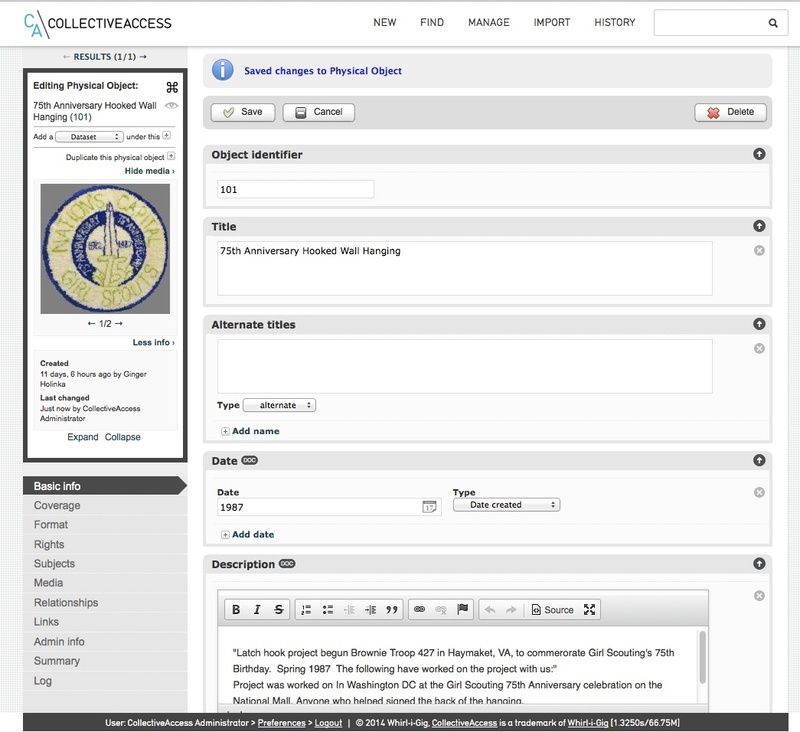 This entry was posted in Collective Access, Memorabilia and tagged Collective Access, Girl Scout Council of the Nation's Capital, Girl Scout history, Girl Scouts, GSCNC, inventory, museums archives, software. Bookmark the permalink.